Does ExpressVPN work well in China? This is our review of ExpressVPN based on real VPN tests done in China. In this review, we will cover Express VPN’s speed, reliability, price, free trial, discount, software, customer service etc. to show whether ExpressVPN is a good for China. In addition to this ExpressVPN review, we have also tested a number of other VPN services from China. If you are looking for a reliable VPN services to be used in China, Please also read our list of Best VPNs for China. Starting Price: $6.67/mo (with discount offer from this link). Is ExpressVPN good for China? ExpressVPN has been listed as one of the best VPNs for China by many VPN reviewers. ExpressVPN’s main domain, expressvpn.com, is currently blocked in China, but you can access their website through some other domain names, for example, expressvpn.works. Based on our tests from China, we confirm that users can sign up ExpressVPN’s services from China and their VPN service can be used in China. In addition to standard payment methods such as credit card and Paypal, Express VPN also accepts Alipay and UnionPay, which is convenient for customers in China. Currently ExpressVPN doesn’t support the Chinese language on their website or software.Basic English skill is needed to use ExpressVPN from China. However, for users who want to sign up ExpressVPN using the Chinese language, there’s a special Chinese landing page provided by ExpressVPN for doing so. China is known for blocking and disrupting VPN services. During certain periods, such as days before important political meetings, most major VPN services might become disrupted and VPN users might find great difficulty in connecting to VPN servers. ExpressVPN is not exceptional in this kind of situation. However, based on our observations, ExpressVPN is usually more reliable in “hard times” than other VPN providers (such as Astrill VPN). For example, in late October 2018, a big attack happened to major VPN services in China. As a result, most VPN services, such as ExpressVPN, VyprVPN etc., experienced a short period of service disruption. Under such situations, some VPN companies would do nothing and just hoped for the best. However, ExpressVPN quickly acknowledged the situation and immediately started working on solutions. An email message was sent out to ExpressVPN’s customers mentioning about the disruption along with a website link for ExpressVPN’s China users to check on the latest status and download the latest software updates to deal with the blocking. With the updated software, released shortly after the disruption, many ExpressVPN’s China users were able to use Express VPN again without any problem. This kind of quick response to China’s VPN blocking really makes ExpressVPN one of the best choices for China’s VPN users. ExpressVPN has servers in 160 locations from 94 countries with unlimited server switches. For VPN users in China, the best server choices for ExpressVPN are Hong Kong, Tokyo and Los Angeles (on ExpressVPN’s desktop software, China users can see a list of recommended servers to connect). 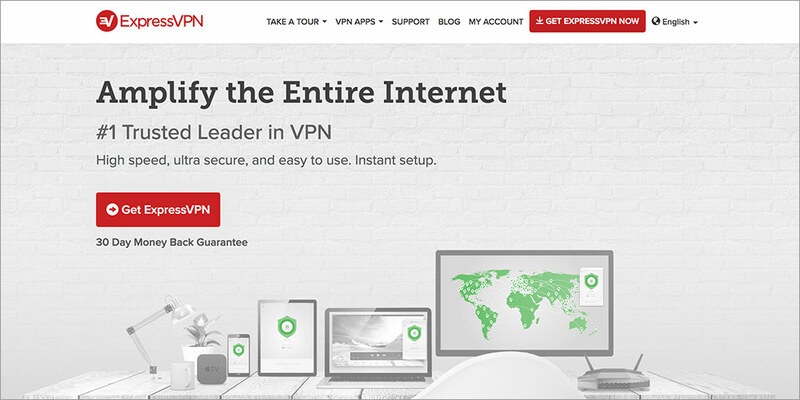 ExpressVPN users can enjoy unlimited speed and unlimited bandwidth. ExpressVPN offers multiple VPN protocol types including OpenVPN (TCP, UDP), L2TP-IPsec, SSTP and PPTP. Based on our testings from China, for ExpressVPN’s users in China, the best option for VPN protocol is to set it to “Automatic”, which will allow ExpressVPN to automatically pick the protocol most appropriate for the user’s network. ExpressVPN’s users can connect from computers, tablets and smartphones using their software or apps, which support Windows, Mac, IOS and Android. For simultaneous connections (or multi-logins), ExpressVPN allows users to connect from up to 3 devices at the same time. ExpressVPN also offers a feature called “Connection Per App” (split tunneling), which means you can choose which software/apps to use (or not to use) VPN when connected. This feature is very useful for users in China, because as most China users use ExpressVPN to unblock websites, it’s not necessary to use VPN on local software/apps such as WeChat, Baidu Cloud, Aliwangwang etc. With this feature, you can let ExpressVPN bypass those software/apps to that their speed won’t be slowed down. ExpressVPN offers a no logging policy. Therefore, when you use ExpressVPN, your online activities are not logged and your privacy is protected. ExpressVPN can be used to bypass NetFlix’s geo-blocking. With ExpressVPN, you can watch NetFlix’s U.S. programs outside of the United States. ExpressVPN allows P2P and Torrenting. ExpressVPN recently started offering browser extensions, which can be installed to web browsers such as Chrome, FireFox and Safari. ExpressVPN’s browser extension makes it easier to turn VPN on and off because the users can do so without leaving the browser. ExpressVPN offers 3 plans: $12.95/month if you pay month by month; $9.99/month if you pay every 6 months and $8.32/month if you pay annually. In addition to standard payment methods such as credit card and Paypal, they also accepts Apipay and UnionPay, which is convenient for customers in China. ExpressVPN offers a 30-day money-back guarantee, which is a much longer free trial period compared to other VPN providers. ExpressVPN offers desktop software for many platforms, including Windows, Mac, Linux, IOS, Android, Apple TV, Amazon Kindle Fire, PlayStation, Xbox and supported routers etc. In addition, installation instructions are provided for setting up ExpressVPN without installing their software for those platforms. With the desktop software, you can connect/disconnect to VPN and also change server locations and switch connection methods. When the ExpressVPN software is running, an icon will stay on the menu bar (or called system tray on Windows), and it will indicate whether you are currently connected or not. For mobile phones running the Android operating system, ExpressVPN provides a free app that can be downloaded from the Google Play app store or by following a link to the APK installation file provided on ExpressVPN’s website. We installed this app on a Android phone. This app has a very clean and easy-to-understand user interface. After logging in, you will see a list of servers for you to choose from, including a top recommendation server location, which is Hong Kong in our case. This app also allows users to run a ping test, which will estimate the distance between you and all ExpressVPN locations to help you choose a server closer to you. 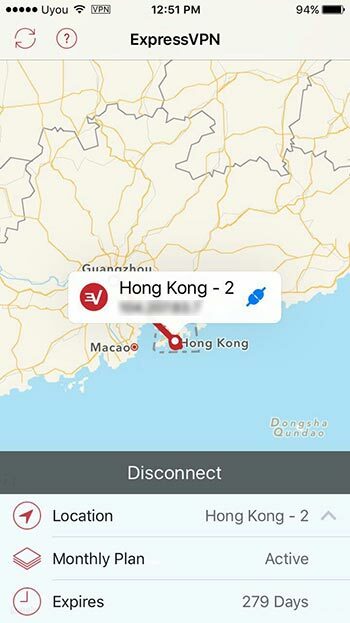 After connected to ExpressVPN’s Hong Kong server, we were able to access blocked contents such as Twitter, Facebook and Youtube on our Android phone without any problem. We were able to play Youtube videos on this phone and the video streaming experience was very smooth. ExpressVPN also provides a free App for iOS. We installed the ExpressVPN app from iPhone’s App Store. 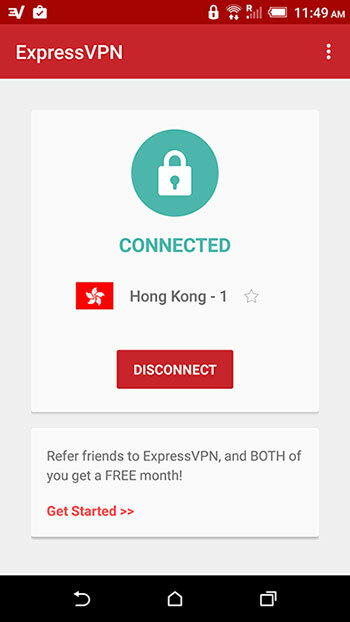 ExpressVPN’s iPhone app looks different from its Android App. The iPhone app includes a map showing your current location and the VPN server locations. When you connect to a server, you will see an animated line connecting two dots on the map, which is pretty cool. We were able to connect to Express VPN’s Hong Kong server. 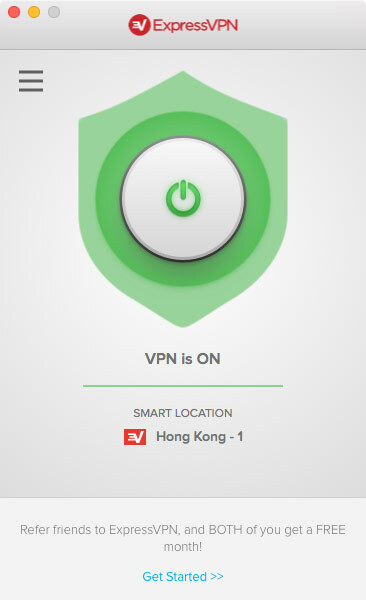 After the connection was established, a VPN icon appeared on top of the iPhone screen, indicating the connection success. With Express VPN connected, we were able to access blocked websites such as YouTube, Facebook and Twitter on our iPhone in China. When we played Youtube videos, the speed was very good. ExpressVPN can also be setup on a compatible Wifi router. ExpressVPN even provides a VPN router app that can be installed on some supported router models. If you are interested, please read our ExpressVPN Router Review. Overall, based on our tests, ExpressVPN offers very fast and stable Internet speed. When you visit ExpressVPN’s website, you will see a live chat box, which allows you to connect to a customer support representative directly round-the-clock. We tried chatting with ExpressVPN’s support team on a number of occasions. Every time we were able to talk to someone within one minute after I initiated the chat session, and their customer support representative seemed to quite helpful and know that they are doing. As a matter of fact, we think ExpressVPN’s customer support is probably one the best among the ones we have tested. Take advantage of ExpressVPN’s 30-day money back guarantee. You can try ExpressVPN for free for 30 days. If it doesn’t work or if you don’t like it, you can cancel your subscription within 30 days to get a full refund. 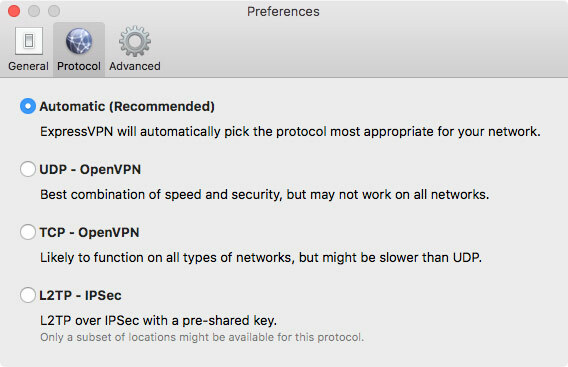 For VPN protocol, choose the “automatic” option to let the ExpressVPN software to pick the best VPN protocol based on your current situation. For VPN servers, choose the ones recommended by ExpressVPN. ExpressVPN has some dedicated servers that are optimized for China users. Those servers are usually located in Hong Kong, Japan or LA and are more stable during China’s VPN blocking. You can find a list of these servers when you open ExpressVPN’s software, or you can contact ExpressVPN’s customer support to ask. Update your VPN software/app on a regular basis. To deal with China’s VPN blocking, ExpressVPN rolls out VPN software/app updates very often. You should always use the most updated version to make sure you can defeat China’s VPN blocking. Make sure your software/app is the most updated version. Make sure you are using the “automatic” protocol. Switch to a difference server (choosing from from the list recommended by ExpressVPN). Contact ExpressVPN’s customer support via Live Chat or visit its support page for status updates and unblocking tips. ExpressVPN is a well-known VPN provider and with many customers. Users can sign up for their service from China and their VPN service work well in China. Their 30-day money-back guarantee offer is generous and their customer support is very fast and helpful. 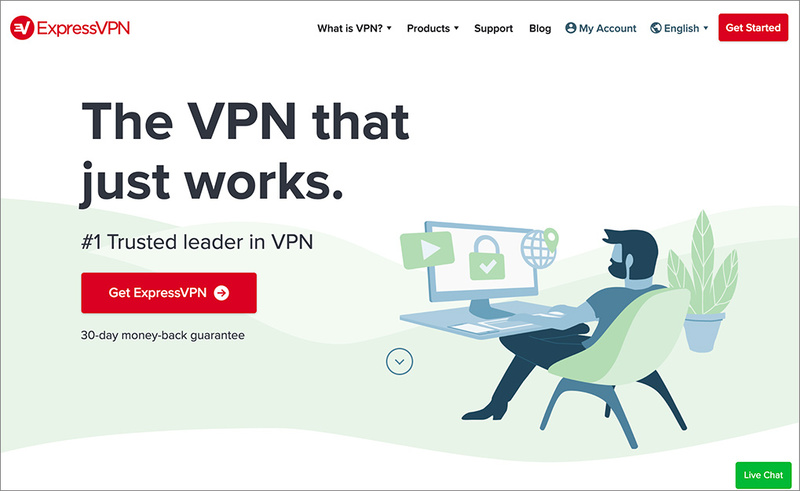 Among all VPN providers we have tested, ExpressVPN really stands out with reliable connections, fast speed and excellent customer supports, as well as quick responses to China’s ongoing VPN blocking. Based on our tests, we recommend this VPN provider and have included it in our Best VPNs for China list. This entry was posted in VPN Reviews and tagged expressvpn, review. Bookmark the permalink.